• Twin tips, fine and ultra fine for a variety of markings. • Polypropylene barrel that prevents ink evaporation. • Twin tip that can draw two line widths, fine 1mm and ultra fine 0.5mm. 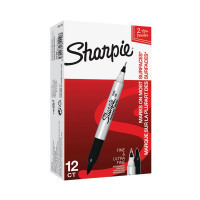 This Sharpie Twin Tip Permanent Marker is suitable for use on most hard surfaces. The unique design features a standard, durable, fibre tip on one end for bold marking and a ultra-fine tip on the other for more detailed work. The ink is fade resistant for long lasting clarity. 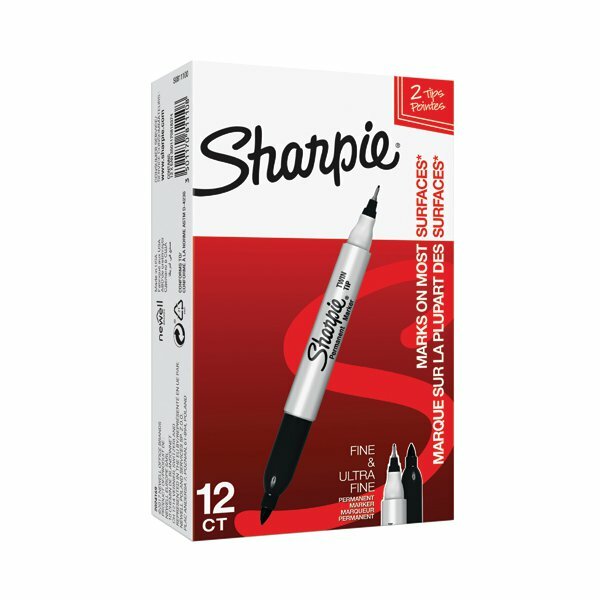 This pack contains 12 black pens with both a 0.9mm and a 0.5mm line width.